I did not create this app, a company called PocketWings, LLC did. Here is a link to them, but as of 02JUN16 it was just an abandoned shell; it looks like everything has been purged. I flew the Sopwith Camel under the bridge and got no new paint job. You can select the alternate paint jobs when you select the plane now. - New airspeed indicator is almost too small on my iPhone to be read, but I bet it looks good on an iPad! - Brakes. No more long rollouts. Will comment more as I learn more. PocketWings: Discovery Island is an exceedingly cool fight sim (or sim-like? *) app for the iPhone and iPad. This page was created with the iPhone version in mind because that's the version I have and am familiar with. (iPad users, Your Mileage Will Surely Vary.) The page is not complete. I don't know what complete means at this early juncture, but I will be adding to it as things occur to me. Meet The Aircraft • Meet Discovery Island • Fun Stuff • Trivia • Recording, etc. *Flight sim aficionados (a group I was—and sort of still am—a member of) will take issue with the use of the word simulator here, and they'd have a point; PocketWings planes suffer no damage when they crash, nor is any damage incurred by ground structures; planes bounce off buildings, balloons, the ground. The only exception to this is that planes will splash into bodies of water and disappear. But there's no shooting! What the hell are you supposed to do? • The tan biplane is a RAF Sopwith Camel, the renowned WWI British fighter. Its paint job resembles that of the plane flown by RAF officer Roy Brown when he engaged The Red Baron. • The red tri-wing is a Fokker Dr. 1, the famous WWI German fighter piloted by Manfed von Richthofen, "The Red Baron." • The green and white heavy twin is a Douglas DC-3 / C-47 Skytrain. • The four-prop, three-tail TWA airliner is a Lockheed C-69 Constellation. • The four-prop beast in Coast Guard dress is a Lockheed C-130 Hercules transport. The C-130 and the Constellation have nose gear. The other four planes are tail-draggers. Once you fly any of the three heavies, you definitely notice a dramatic decrease in response and handling compared to any of the three singles. My goal with this section, which in fact was the main reason I started this page in the first place, is to create a decent map of Discovery Island. I'm a map junkie in the worst way, and I know I'll have a ton more fun with this app if I can have a map handy. The map is in progress, stay tuned. In the meantime, here's the current draft. As you can see I started with a sketch, then scanned it, and now am overwriting digitally. Eventually the only gray will be the city block, and spots that indicate tunnel entrances. - Discovery Island is essentially a jagged-edged square that is roughly 5.5 to 6 miles (8.8 to 9.7 km) per side. - The northern and eastern coastlines are mountainous (as I mentioned in the intro, I'm assuming that due north is the direction the plane is facing at the start position) the southern and western coasts are lowland beaches or wetlands. The central part of the island is covered with what appears primarily to be farmland. - A mighty river wends and slices more or less diagonally through the island in a NW - SE direction, bisecting the island into NE and SW halves. - The one city, on its perfecty rectangular 2500' x 2000' (760m x 610m) gray foundation :-) is in the center of the southern coast, more or less. - As I mentioned in the intro, there are two airfields on Discovery Island. - There are three significant smaller islands off the coast of Discovery Island. 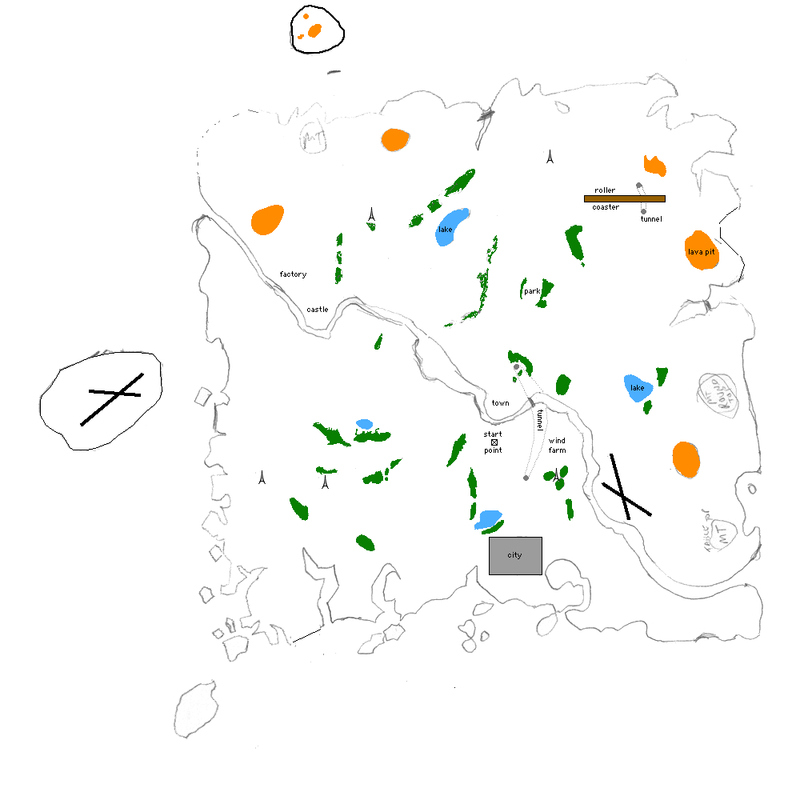 In the spirit of cartographers of yore, I'm making the map, I name the islands! • "Lava Island" is beyond Discovery Island's northern coast. It has one large lava pit and two smaller lava pits. There is an old-timey (wooden deck) aircraft carrier between Discovery Island and Lava Island; details about the carrier in the Fun Stuff section, below. • "West Island" is off the western coast, and has the controlled airfield on it I just mentioned. • "Southwest Island" is a tall, grass-capped island off the southwestern corner of Discovery Island. (From a distance it bears a passing resemblance to Devil's Tower National Monument.) I was thinking it was Discovery Island's highest point, but this is probably an optical illusion since Southwest Island is surrounded by the sea and low-lying beaches, while the peaks on the north and east coasts are surrounded by higher terrain. - The clouds are lovely—very realistic— but you can't fly through them, or to them, for that matter. You can climb high enough that you lose sight of Discovery Island entirely and appear to be over an endless ocean, but you never get any closer to the clouds. (TIP: If you ever want or need to gain serious altitude—or go anywhere—fast, use the Hellcat. That sucker climbs like a rocket.) ANOTHER INTERESTING THING ABOUT THE CLOUDS: They do not move. If you fly around long enough, you instinctively start to use ground features for direction (the essence of VFR, of course) but since the clouds do not move no matter where you are, it is possible to use them as a compass. Reset sometime and before tapping FLY just pan around the motionless Sopwith camel. Look down the length of the leading edge of the wing in both directions and get a feel for which clouds are due east and west. Look directly forward and directly backward to familiarize yourself with which clouds are due north and due south. Since the Sopwith's shape is a perfect 90° cross (or "T") you can eyeball northeast, southeast, southwest and northwest and associate those clouds with those directions, if you like. - Discovery Island has two sea arches (aka natural bridges, natural arches), one about midway down the eastern coastline, the other is centrally located on the northern coastline. - The Sopwith Camel turns white, with RAF insignia and a red heart on the side of the fuselage. - The Hellcat gets a "target-tow" paint job: gray fuselage, yellow wings and tail planes, red rudder, red stripes on the inboard wings. - The Fokker gets Lt. von Raben's paint scheme where the front half of the plane is blue and the back is white, with a white raven under the cockpit. - The DC-3 gets what looks like some sort of military paint job where the fuselage and tail fin are red and the wings and horizontal stabilzers are white. - If you can get that Connie under the low bridge in one piece (!) the plane gets a rather wild looking US NAVY paint job; the upper fuselage is midnight blue, the entire tail section and the outer half of each wing is red-orange, and the sides and bottom of the fuselage and the inboard half of each wing are gray. - The C-130 assumes a United Nations paint job (judging by the "UN" letters that appear on the left wing and fuselage) where the fuselage and tail fin are white and the wings and horizontal stabilizers are light gray. • Balloon-floated runways. They are about 50' wide, which, if you take a look at the wingspans of the six planes, not everyone should try the floating runways. (Although if you're like me, you couldn't resist seeing if a C-130 would actually bounce off a balloon tether.) These guys are, for me, the toughest challenge so far. 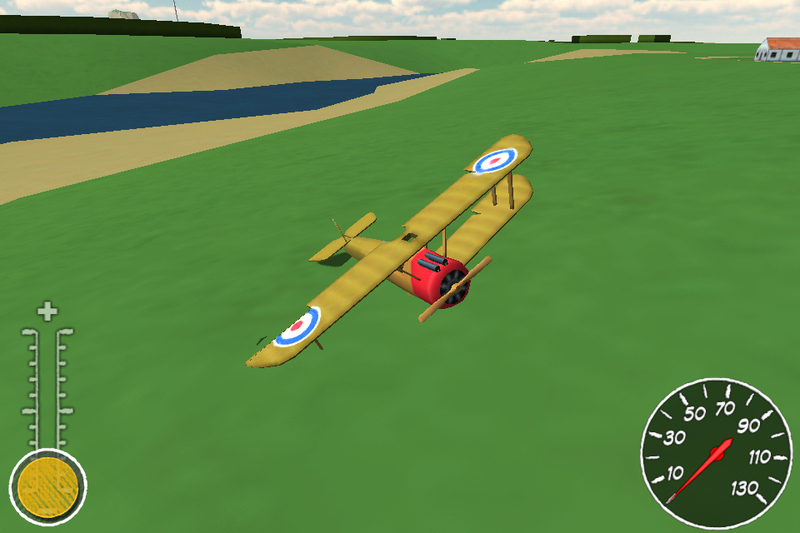 I've taken a couple dozen tries in the Sopwith Camel and the best I've been able to do is a nose-over. The runways are SHORT. • Aircraft Carrier. Fly straight/north after starting, pass under the natural bridge off in the distance, then turn left/west, you'll be right on the carrier's heading. The carrier has an effective landing width of about 100' (62m). I recommend the Hellcat to get you there quickly, then after making the turn west, transfer to a Sopwith or Fokker. • Roller Coaster? (what the hell else would you call it?) I have no idea what that big thing is in the NE corner of the island, but I was able to land the Sopwith Camel on it and use the prop to pull me all the way up the slope. Kinda cool. One of Discovery Island's two tunnels goes through the mountain, under the Roller Coaster. • Tunnels. There are two. "Mountain Tunnel" is a relatively short one that goes through the green mountain under the Roller Coaster. "River Tunnel" is longer and goes under the river at the location of the low bridge ("Paint Job Bridge!"). • Flying Saucer. A flying saucer lies in wait somewhere on Discovery Island! • Big green chunks of forest are about 40' (12.6m) tall. • That supposedly "low" bridge you fly under to change paint jobs? About 270' (82m) average width underneath (it's wider closer to the water), with about 95' (29m) vertical clearance from the water to the underside of the bridge. Not so low after all. • The wind turbines are something like 500' (150m) tall. The rotating blades are each about 100' (30m) long. • There are four electrical towers south of the river and two north. I think of them as Eiffel Towers for obvious reasons but at 130' (46m) wide at the base and roughly 300' (91m) tall, they're less than 1/3 the height of the real deal. • The tallest building in the city is about 60 stories and about 850' (260m) tall. When you press the FLY button everything you do is entered into the game's five-minute memory cache, and can then be either viewed again by you, or even recorded into a stand-alone movie. 2) record it (by pressing RECORD ). 3) DO IT OVER (by pressing FLY ). This will overwrite your beautiful pattern of course, so be careful: if you want to watch it or record it, DO NOT TAP THE FLY BUTTON, OR ELSE THE THING YOU WANT TO WATCH OR RECORD WILL BE GONE. VERY COOL: This DO OVER option is INFINITELY HANDY. Say you want to try a difficult maneuver (flying under a bridge, say) and you crash during the attempt. Simply touch the screen to stop, tap REWIND a few times, and give it another shot by tapping the FLY button! And when you fail again :-) do it over again! And again after that. Seriously, this DO OVER ability is one of the cooler things about Pocket Wings! The cache has a five minute capacity so if you have been flying for, say, seven minutes, only the most recent five minutes will be viewable/recordable. If you close the app but don't fully quit it, the cache is not cleared but data stops being entered into the cache. In other words, you can fly for three minutes, close the app and do something else with your iPhone, open PocketWings back up, press FLY again and you still have that three minutes available for viewing or recording. Keep flying. Anything older than 5 minutes will "scroll off" the back end of the flight cache. Press the "RESTART" button . That will clear the cache and send you back to the start position in a Sopwith Camel. As I mentioned a second ago, merely pressing the iPhone's HOME button to get to the iPhone's menu screen will not clear the flight cache. BUT...if you get back to the iPhone's menu screen and press the HOME button twice quickly to activate the Multitask Menu, and then close PocketWings from the Multitask Menu...that WILL fully quit PocketWings and clear the flight cache. Powering off your iPhone completely will not clear the Multitask Menu but WILL cause PocketWings to relaunch, clearing the flight cache. Anytime you see the blue launch screen where PocketWings tells you it is "Loading, Reading verts, Assigning uv's, Reticulating splines, Mipping textures, integrating Reynold's number"...rest assured the app is completely restarting and you're going back to the start position with a fresh Sopwith Camel and an empty flight cache. iPhone mythbusting: The apps that appear in the Multitask Menu are NOT still running in the background, draining battery power, as is often claimed. The icons in the Multitask menu are ALIASES of programs you've had open recently, and nothing more. - The flight cache stores any view angles/viewing distances you used while flying in Free view mode so when you first rewind you'll view (or record) the flight the way you initially saw it. Later, when you are viewing a flight or recording it YOU CAN CHANGE FREE VIEW ANGLES AND VIEW DISTANCES AND THESE NEW PARAMETERS WILL BE INCORPORATED INTO YOUR RECORDING. The recording is a little jerky when you change angles, but still, it's pretty damned cool to fly a wild flight then watch it or record it from every conceivable angle or distance! - IF, WHILE RECORDING, YOU TRY TO CHANGE MODES (from Free to Chase, or vice versa) PocketWings ENDS THE RECORDING. You can press RECORD in the new mode, to continue where you left off, but everything after the mode change will appear in a separate movie clip.